Mike Littleton: Mike is the Community Relations Manager at BIA. Bristol is a word that has become synonymous with aviation and the name has become associated with many notable firsts in the field. In 1927 a group of Bristol businessmen formed the first flying club in the country at Filton aerodrome. The club is still operating today on the south side of Bristol International Airport. 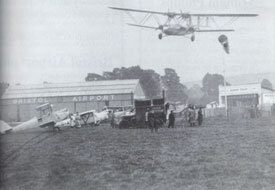 The members soon realised that operating from a manufacturer's field test flying civil and military aircraft was not conducive to their hobby so they managed to persuade Bristol City Council that the future lay in aviation and farmland at Whitchurch was earmarked to become Bristol's first airport which was opened by Prince George in 1930. The thirties was a pioneering decade for aviation which started with flimsy bi planes made of wood, covered in fabric and held together with bracing wire to all metal monoplanes with retractable undercarriages which required a hard runway. By the time the Second World War broke out in 1939 Bristol Airport was handling 4000 passengers a year and an east west tarmac runway of about 1000 yards was laid. The German invasion of the Netherlands saw KLM pilots fly their war damaged aircraft to Great Britain. They landed at Shoreham but continued to operate their scheduled services from Corydon Airport. When this airport was bombed, KLM and Imperial Airways, who later became British Airways moved to Bristol which became the only aerodrome to remain open for civil operations throughout the remainder of the war. A link to America was established through the seaplane base in Foynes and British Airways flew scheduled services to Gibraltar and North Africa. KLM operated a 4 times weekly service to Lisbon in neutral Portugal. These flights involved a degree of intrigue and were probably used by spies and exchange prisoners of war as well as diplomats and politicians. Check in was carried out at the Grand Hotel in the city centre and passengers were then taken to the airfield in a bus with blacked out windows. The flights operated almost without incident until June 1 1943 when flight BOAC777 a DC3 owned by KLM and chartered to British Airways, named "Ibis" was shot down over the Bay of Biscay by a squadron of Luftwaffe fighters. Much speculation still abounds over the reason for this unprecedented attack, the actor Lesley Howard was on board but it is possible that his manager, Alfred T Chennals may have been mistaken for Winston Churchill. At the outbreak of the Second World War the Air Ministry set up an elementary flying school at Weston super Mare which was quickly outgrown. A relief landing ground was established at Broadfield Down in Wrington Manor. With the growing threat of invasion, it was decided to relocate the experimental fighter station at Boscombe Down and so began the construction of RAF Lulsgate Bottom. The first arrival was not expected. A Junkers 88 had been bombing the Wirral and lured by a false beacon at RAF Locking, descended below cloud over the Bristol Channel and mistaking it for the English Channel, saw the airfield under construction and landed on the south west runway. The crew was captured by contractors working on the site and the aircraft was painted in RAF colours before being flown to Farnborough for evaluation. The airfield was handed over to Flying Training Command. No. 3 Flying Instructor School took up residence, re-training ex-operational bomber crews to teach at Operational Training Units. When hostilities ceased, the airfield was decommissioned and it became the home of the Bristol Gliding Club. The Bristol Motor Cycle and Light Car Club hosted motor racing there for a while but noise and planning issues prompted a move of this organisation to Castle Combe. During the war Bristol City Council had realised that Whitchurch could not be developed further and started to look for an alternative site. Filton was rejected in 1949 again as it was felt that civil flying would not mix with military and test flying. In 1955 the City Council decided to buy the former RAF Lulsgate Bottom airfield and following negotiations, purchased the site for £55,000. Work began construction a terminal building and installing passenger facilities. The decision was not without controversy because the airfield was prone to warm sector conditions from the Severn Estuary which meant it was often affected by fog. 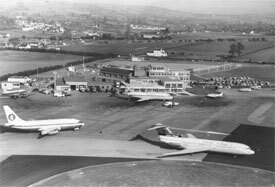 Nevertheless the airport was opened in 1957 by Princess Marina the Duchess of Kent with the claim that its convenient location, just 8 miles south of the city centre was surrounded by open country which would enable it to develop to meet future transport requirements. During its first year of operation it handled 30,000 passengers and in 1961 19 destinations were offered including Dublin Paris and Le Touquet, all dictated by the type of aircraft that could operate from its 1,200 yard runway. During the sixties, people began to tire of the cool damp summers that this country could produce and seek guaranteed good weather. The runway was extended to its present length of 2011 metres to enable it to handle the first generation of passenger jets that could whisk holidays to the Costas in two and a half hours. The terminal was extended and the car park was enlarged to accommodate 660 motor cars. In 1968 the passenger count was 360,000 per annum. Success was short lived, however, because 1974 saw the collapse of Court Line, a major tour operator who owed not only Bristol, but a lot of airports a considerable amount of money. The arrival of the charismatic Les Wilson, one of aviation's most colourful characters as Managing Director in 1980 brought about a dramatic change in the fortunes of Bristol Airport. He first courted contacts in tour operators including Thomson and Horizon and with the holiday trade secure and growing, turned his attention to contacts in business aviation to improve Bristol's international links. 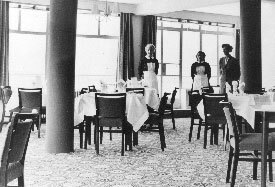 In 1984 saw the introduction of many improvements including a new International Departure Lounge with a duty free shop and 24 hour airside bar. The passenger experience was also enhanced with the installation of new check in desks with electronic scales, new baggage belts, tour operators desks, improved car parking arrangements and facilities for disabled travelers. As a result of the 1985 Airports Act all employees were transferred from Bristol City Council to Bristol Airport plc in 1987. More improvements were made to the terminal and in 1988 100,000 scheduled passengers passed through the airport. Bristol Airport's performance quickly outstripped even Les Wilson's most optimistic forecasts. Within four years passenger numbers had almost doubled. The 1 million figure was passed in 1992 as more destinations became available from the airport. 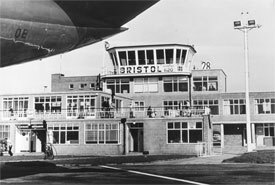 In 1997 the airport was put up for sale by Bristol City Council and the First group of companies acquired 51% of the shares. This made available funds for an ambitious investment programme to include the construction of a new terminal building, improvements to the car parking structure and a new air traffic control complex which included the installation of a state of the art blind landing system enabling aircraft to land in conditions of severely reduced visibility. The airport was also rebranded as Bristol International. The terminal was opened in March 2000 by the Princess Royal. In January 2001 the airport was sold to Macquarie and Cintra for £198 million and later in the year Go Fly, a low cost carrier arrived to make Bristol its second largest base outside London. The acquisition of Go Fly by easyJet and continued development led to a further increase in passengers to 3.8 million. Continental Airlines began a daily scheduled service to New York in May 2005. Macquarie's stake became part of MAp Airports in 2009 and a Canadian Teacher's pension fund that has invested in British airports, also became a shareholder. Looking ahead to the future, Bristol International Airport has submitted plans for the enhancement and development of its services to handle 10 million passengers by 2014/20, an ambitious programme which will involve increasing the size of the passenger terminal, the construction of a multi storey car park containing a public transport interchange and an on site hotel. Future development will be focused on land that is already owned by the airport. Whitchurch with Handley Page HP42 aircraft making its final approach to land. Probably the only thing in common with today's aviation is that pilots still rely on a wind sleeve to determine the wind speed and direction. 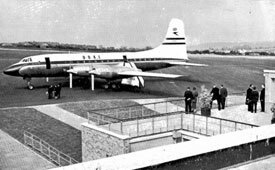 Bristol Britannia which landed on opening day at Lulsgate, bringing various VIPs and dignitaries. 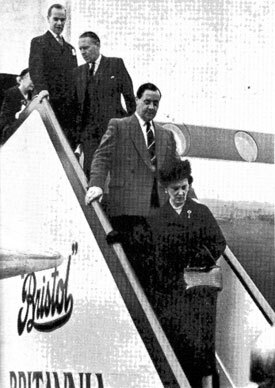 The Duchess of Kent, who opened the airport, descending the steps from the Britannia. Airport catering in the late fifties. Taken in 1968, this photo shows the first generation of jets which could whisk holidaymakers to the Costas in two and a half hours. The Dan Air DC3 on the left was registered GAMPP and took business men on an inter city scheduled service route. The terminal and air traffic control tower taken from beneath the tail of a Cambrian BAC1-11, 1968.